"The Harappans are referred to as a Bronze Age culture," writes Vasant Shinde, "and they used copper and bronze to manufacture axes, adzes, knives, fish hooks, chisels, pots and pans and jewelry in form of bangles, beads, or diadem strips. The Harappans seem to have preferred pure copper, which was manufactured into objects by beating the metal sheets into the required shape. Copper alloying was a common aspect of metallurgy with contemporaneous civilizations, but only 30% of the 177 copper artifacts from Harappa and Mohenjo Daro demonstrated tin, arsenic, nickel or lead alloying, of which tin is the most common. The amount of tin has ranged from 1 to 12% in the bronze artifacts studied. Besides copper, the Harappans worked with gold, silver and lead. "Copper artifacts are found at larger and more economically developed settlements. A few copper vessels and beads have been found in hoards but, unlike other metal objects, especially gold and silver, more than 75% of copper artifacts, ornaments, and vessels have been found in nonhoard contexts, including burials. The items are relatively scarce, though, indicating that copper was not in popular use either because of limited availability or perhaps because these rare items served as symbols of wealth and status. As such, it may be that copper was passed down from one generation to another, and recycled, as is the case today in the region (Agarwal, 2007). Despite the advanced manufacturing techniques, and the largely decorative utility of many objects, elaborate ornamental aspects are not a common feature on these items; their simple and modest style may reflect a value central to Harappan ideology." Vasant Shinde, Current Perspectives on the Harappan Civilization, in A Companion to South Asia in the Past, p. 132. 1. 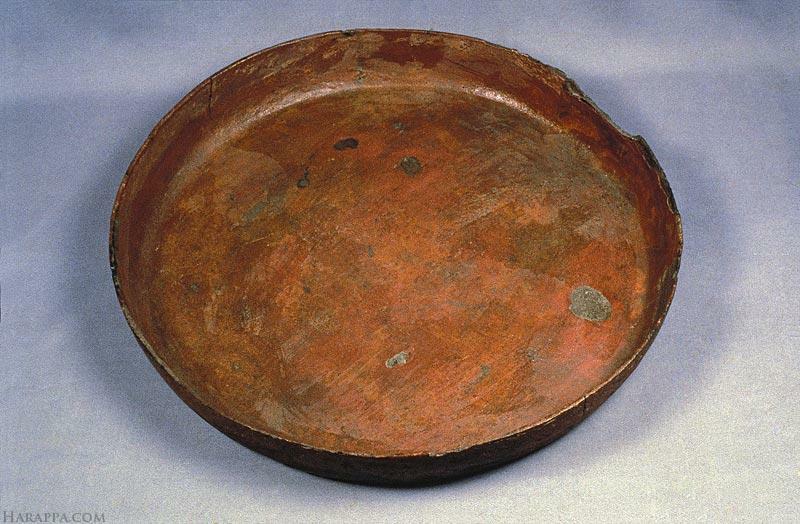 Copper and bronze plates like this from Mohenjo-daro were probably used exclusively by wealthy upper class city dwellers. 2. 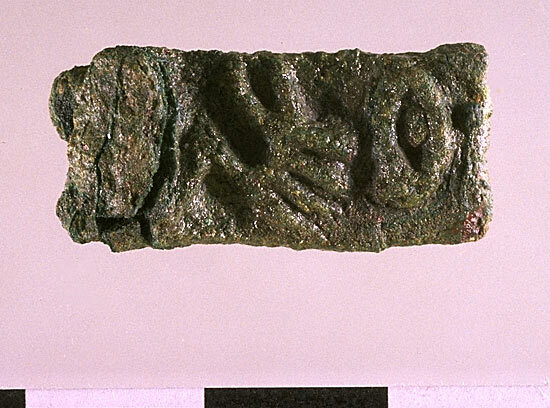 Copper tablet (H2000-4498/9889-01) with raised script found in Trench 43. 3. Ledged cooking vessel with high neck and flaring rim, Mohenjo-daro. This metal vessel is almost identical to many terra cotta cooking vessels and was probably intended for a very wealthy family. It was made by hammering a sheet of copper and raising the hollow base and rim separately. The two pieces were joined together with cold hammering at the ledge. 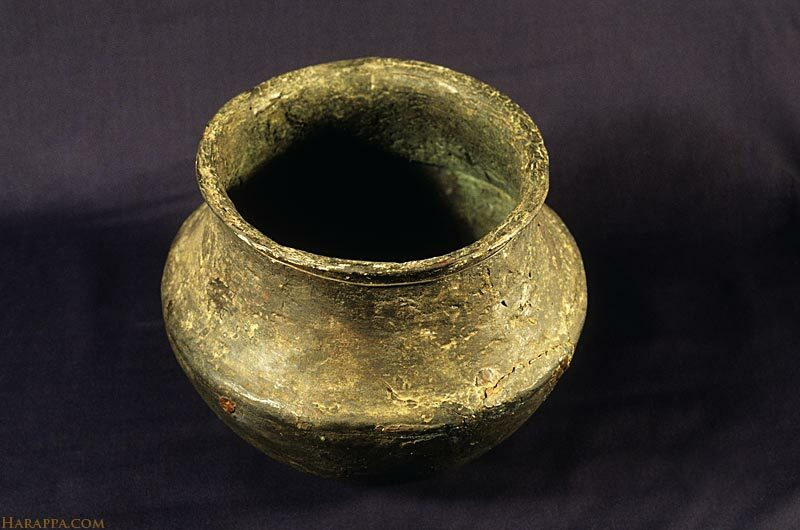 This vessel contained a hoard of copper weapons and tools. 4. 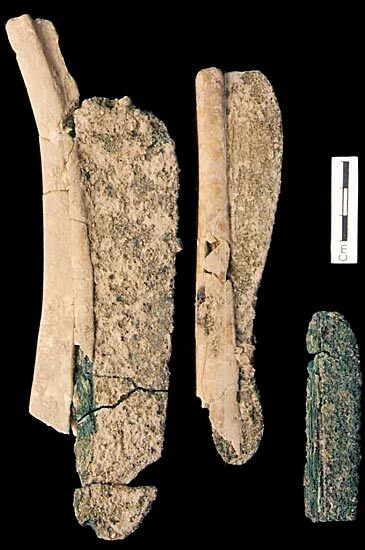 Copper knives with bone handles found at Gola Dhoro. 5. 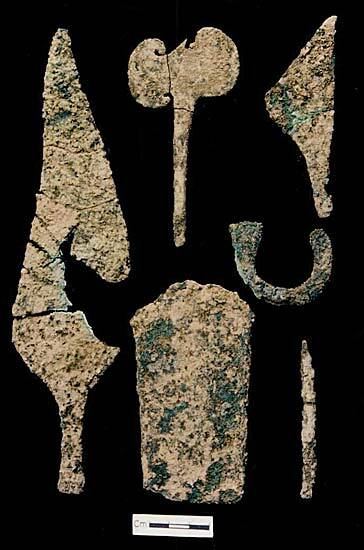 Indus Valley copper artifacts found at Gola Dhoro.